Abahani Limited overwhelmed Legends of Rupganj with a thumping 94-run victory to win the Dhaka Premier Division Cricket League (DPL) for 19th time at Bangladesh Krira Shikkha Protisthan Ground 3 in Savar on Thursday. Abahani’s equation was simple, they needed to beat Rupganj in their last super league match to confirm the trophy. Of course, a loss was not the end of Abahani’s title hopes but they captured the coveted DPL trophy in fashion. Nasir Hossain led his side to a 94-run victory with a blazing captain’s knock of 129 while opener Nazmul Hossain Shanto smashed 113 that propelled Abahani to a virtually unassailable total of 374 for six. In response, Rupganj handicapped with the first-over dismissal of Abdul Mazid, fought hard till 42.4 over but could manage 280 runs. Mohammad Naim (70), Mushfiqur Rahim (67) and captain Naeem Islam (76) kept Rupganj in the hunt for some time with sparkling half centuries but the target proved too much. The imposing total was too tough for Rupganj as talented all-rounder Nasir alongside Sandip Roy, Sunzamul Islam and Mehedi Hasan Miraz grabbed two wickets apiece to ensure there was no late drama. Rupganj bowling attack, which had been highly impressive in this tournament, let the team down in the most important match after Naeem Islam had elected to field on a pitch that offered substantial help to the batsmen. Strike bowler Mohammad Sahid, who took four wickets against Gazi Group, conceded 81 runs from his nine overs while Asif Hasan allowed 93 runs from 10 overs. Abahani cashed in merrily, cruising to 92-0 in the first 12 overs, comfortably their one of the best start of DPL campaign this year. Anamul struck a fluent 57 and partner Nazmul moved cautiously. After a stumble in mid-innings, the player of the match Nasir came when the score was 123 for 3. He crushed the bowlers with brutal and scintillating shots, hitting 129 off just 91 balls including 15 fours and four sixes. Nasir and Nazmul plundered 187 runs for the fourth-wicket stand and when Nasir was out, Abahani reached 310 in 44th over. Nazmul picked up his fourth century of the tournament facing 97 balls which was decorated with 11 fours and two sixes. Abahani’s imposing total was also boosted by a late flurry by Mashrafe Mortaza who clubbed fours sixes in an eight-ball blitz. Mashrafe was unbeaten on 28. Parvez Rasool bagged three wickets for Rupganj. Since its inauguration in 1974–75, the league has been the premier club cricket competition in Bangladesh. It gained List A status starting with the 2013–14 tournament, thus superseding the National Cricket League One-Day as Bangladesh’s main List A competition. 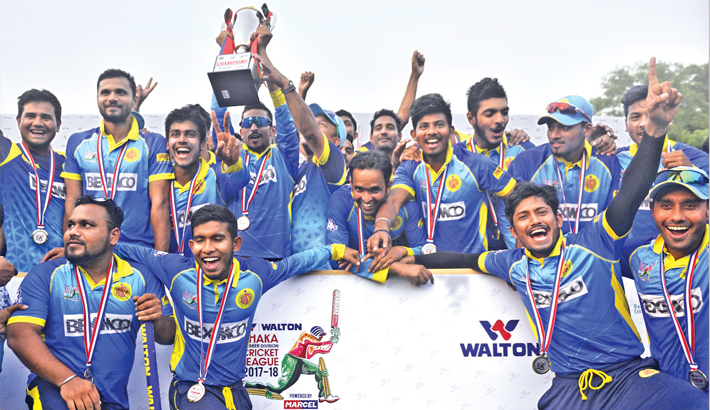 For second time since its gained List A status, DPL title is in Abahani’s hands. In the years from 1974–75 to 2011–12, Abahani Ltd won the championship 17 times. Other winners were Mohammedan Sporting Club nine times, Biman Bangladesh Airlines five times, Victoria Sporting Club four times, Old DOHS Sports Club twice and Brothers Union once.